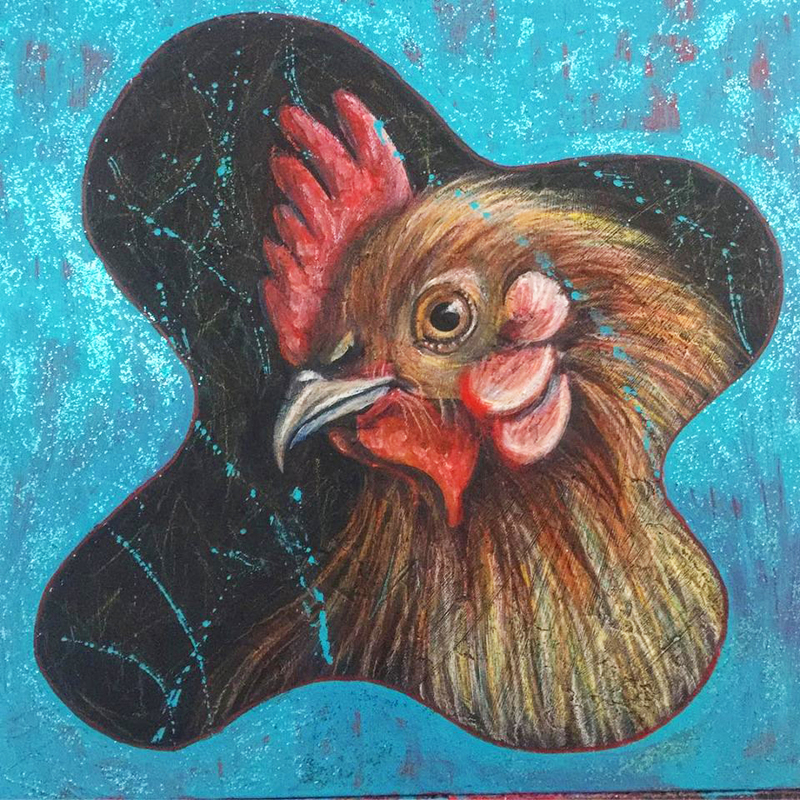 NOTE: Ask me about a portrait of your furry or feathered fmily member. My late brother Jim Solberg had a quiet unassuming way about him. Sickly as a child, he turned to nature for his solace. He could observe the micro world of insects for hours on end. He collected all manner of fascinating and colorful bugs trading with others throughout the world. Working quietly in the solitude of his bedroom laboratory, he painstakingly catalogued, pinned and labeled each creepy-crawly with perfect tiny hand lettering on microscopic tags. This same patience and quiet respect allowed him later in life to capture intimate scenes of nature through his lens. The legacy of portraits he left are a great source for my paintings and a constant reminder of him. 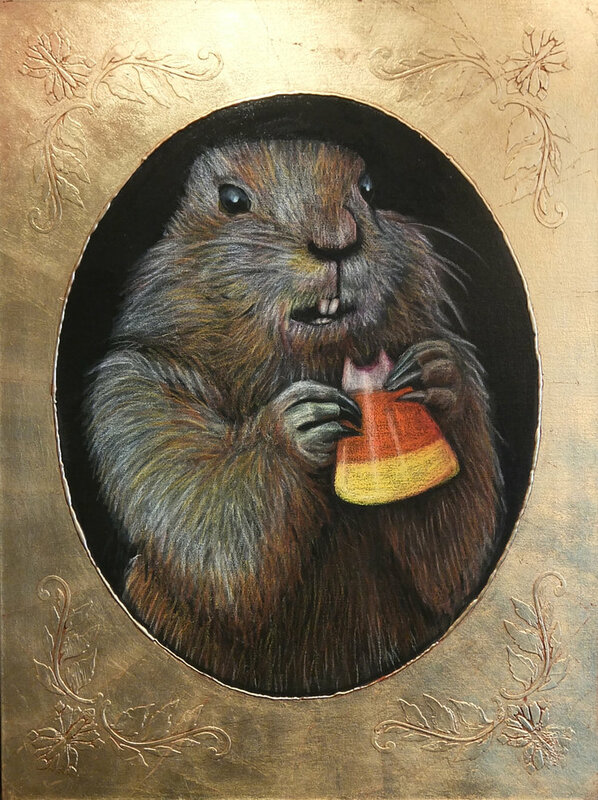 Beaver with Candy Corn. Once considered a pest and hunted to virtual extinction, the beaver should now be looked at as a savior of our embattled Ecosystem. Compelled to build their dams near rushing waters, the beaver’s habitat slows down the flow and creates ponding. This contributes to the water being better absorbed by the land, allowing it to resist both droughts and floods a lot better. In CA the beaver has helped with the drought and elsewhere has contributed to undoing the damage caused by our chemical fertilizers washing into our rivers and streams and choking the marine life. Many species owe their survival to the beaver including The Mule deer, the Sandhill Crane and of course many fish species. Long live the Beaver! Benjamin, the last living member of the Thylacine species (aka Tasmanian Tiger), is believed to have died as the result of neglect; locked out of his sheltered sleeping quarters at the Hobart Zoo, he was left exposed to the bitter cold Tasmanian night. That same night signaled the end of this marsupial species more kangaroo than dog, which had walked the earth since the Pliocene epoch four million years ago. from Audubon ; In 1871 their great communal nesting sites had covered 850 square miles of Wisconsin’s sandy oak barrens—136 million breeding adults, naturalist A.W. Schorger later estimated. After that the population plummeted until, by the mid-1890s, wild flock sizes numbered in the dozens rather than the hundreds of millions (or even billions). Then they disappeared altogether, except for three captive breeding flocks spread across the Midwest. About September 1, 1914, the last known passenger pigeon, a female named Martha, died at the Cincinnati Zoo. She was roughly 29 years old, with a palsy that made her tremble. Not once in her life had she laid a fertile egg. From series "Important Men at Meeting"